Ok, so “post-apopalyptic” might be a bit of an over exaggeration, but not by a whole lot! While rock-climbing in Ha Long (I’ll write about that soon, I swear!) Becky managed to get a small scratch no larger than a piece of long-grain rice. Of course, it’s not that simple in developing countries, where the word “sanitary” has yet to enter the vocabulary. Within two days, it became a swollen, purple mass of scary. And by”scary” I mean that people would glance at it, make a startled noise and say “Oh my god! What happened to your leg? !” We were starting to frighten passerby’s. I supposed this is the time to visit a doctor. 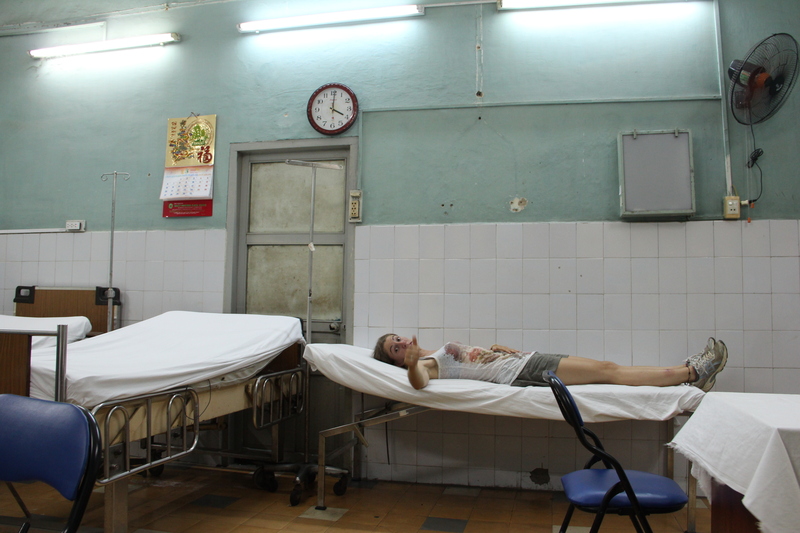 Of course, in Vietnam, you don’t go to doctors, you just go to the hospital. First, we get broken-English directions from our Vietnamese hostel operators. (“So you want me to turn right where?” “Next to ice cream” “OK, so I turn right at the nondescript ice cream store/stand/cone that will appear out of thin air. Got it.”) You’d think a hospital would be hard to miss. You’d be wrong. We walked for quite a while (no sign of ice cream, I might add) without seeing anything that might be a hospital. Finally we asked some policemen looking worryingly unoccupied to point us in the correct direction. As we walk up to the hospital, there is a man sitting at a table out front dressed in a uniform, so Becky simply lifts her legs and points. He reacted more as if an apparition had presented itself was asking the time. He stared open-mouthed for a fraction of a second before making a startled noised and jumping out of his seat, gesturing hurriedly for Becky to follow. The outside of the Hospital is painted dishwater-blue with a crumbling facade. Typical. The inside is even less promising. Despite what you may think, it was like a ghost town, with no one in sight. We walk down dirty hallways with yellowing walls and past rows and rows of colorful plastic chairs fixed to the wall, which only add to the eeriness. The main hallway is large and open, with a darkened room on the left. Mind you, this is a room of impressive size with large glass windows offering a look into what is not unlike a quarantine zone, with rows and rows of cots. Right now, there isn’t a soul in there. No pun intended. We walk down this hallway to the only sign of life in the building; a set of saloon-style doors with light streaming from within. Inside there is a nurse who regards us suspiciously and a girl laying in a bed hooked up to an IV. The room is tall and bare, except for one cheery chinese calendar on the wall. The nurse motions to a sign in book and then to the chairs a long the way. She places a brief phone call to who we can only assume is the doctor. After an awkward wait, a doctor bustles in, giving off the air that he can’t be bothered with us. He quickly exchanges words with Becky and scribbles on a piece of paper. Then he gathers his things and leaves. The nurse cleans Becky’s wound and then leads us down the hallway to the “pharmacy.” Of course, it’s a small glass room with one guy working, pulling pills out of packets and moving them into bags to label them (in Vietnamese) for us. After a round of thank you’s, we gladly exit and leave the eerie hospital behind us. With an antibiotic, a painkiller, and a mystery drug. To this day, we don’t know what the third medicine was. I’m convinced she is now immune to biological warfare. Or she’s about to grow a third arm. Both, are effective outcomes. In case you’re wondering Becky is all healed now, despite her brush with death. Such a good story and such a happy ending!